Termination of VoIP traffic is a promising direction to start a telecommunications business in Benin. 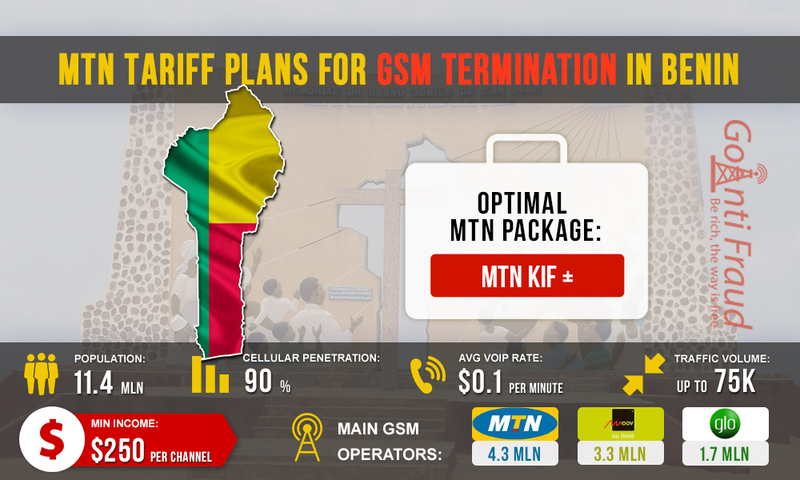 By installing GoIP VoIP equipment in Benin, the terminator can make $250 from each GSM channel. With a population of more than 11.4 million, mobile penetration is 90%. This provides inflows of large volumes of international traffic to the country. The largest GSM operator in Benin is MTN as its market share is almost 50%. MTN Benin services are used by about 4.3 million subscribers. If you want to do a profitable VoIP GSM termination, it is necessary to choose a favorable prepaid tariff plan. Do you want to be the first to receive useful information about new GoAntiFraud features? Subscribe to our YouTube channel to stay tuned! We take care of our customers, so we regularly prepare useful video clips that will help you deal with the service and solve the terminator’s current problems (e.g. SIM-card lock, reduction of business expenses, etc.). Sign up right now to be timely notified if there are new videos! Wabaa. Calls to 5 "preferred" numbers are charged at half price ($0.00086 per second). A minute of the conversation costs $0.05. MTN Kif +. The on-net call costs $0.0017 per second, that is, the minute of the conversation will cost $0.1 (from 6 am to 12 am). At night (from 00.00 to 6.00) local calls are charged at $0.00086 per second, that is, the minute costs $0.05. The optimal package for VoIP GSM termination is Kif +. If you use a GoIP 8 gateway after 12.00 a.m., a minute of the call will cost 5 cents. Terminating 3 hours a day via the package, you will make over $100 per channel. GoAntiFraud offers a comprehensive solution for best GSM termination using GoIP equipment. We cooperate directly with Hybertone manufacturer, so you can buy GSM gateways and SIM GoIP banks at the lowest price. For those who begin doing VoIP termination, we offer NewBusiness solution that includes the required set of equipment, software for automation and tools to protect against the SIM-block.